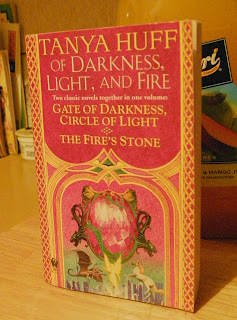 Tanya Huff has written a mixed bag of fantasy and sci-fi, mostly featuring queer characters. She's an openly lesbian author who's written a fairly large number of books of hit and miss quality, all over the scale. If you like Mercedes Lackey, then you'll enjoy her fantasy Quarters series; and her urban fantasy is similar, too. She's probably the most famous for the mystery/ vampire Blood series, though. However, most of these focus on gay or bisexual men - the only lesbian main characters are in The Keeper's Chronicles and (arguably) Valor Confederation , and the short stories about Terizan the thief. She has also written a number of short stories, and her anthologies are strong, varied and entertaining fantasy. Her short story collections are generally very good and worth picking up, and do feature occasional lesbian characters: What Ho, Magic!, Finding Magic, Finding Magic and Stealing Magic. The latter two contain the most Terizan stories. In The Keeper's Chronicle , a fairly light hearted urban fantasy, we get Diana (the younger sister of the main character, Claire Hansen) who becomes the focus in the third book, Long Hot Summoning , when she gets old enough to find a girlfriend (an ex-elf) and starts becoming the more central character. Basically, the two girls/women are 'Keepers' of the magical boundaries, and many magical hijinks ensue. The first two books follow Claire and Dean, with Diana as the troublemaking younger sibling - and to be honest, they are better books. In Valor Confederation (beginning with Valor's Choice), we have a solid science fiction following the soldier Torin Kerr around the galaxy (or sometimes trapped on one planet). More serious than Bujold's Vorkosigan books, more practical and believable than Elizabeth Moon's Serrano books and less technical and more accessible than David Weber's Honor Harrington series, I generally recommend it. It's most like the last, including the itch that missing 'u' in Honour and Valour give me. There are some very sexual (and bisexual) humanoid aliens who are enlisted alongside humans, who also have the ability to arouse humans of any gender without even meaning to - this is a fairly constant theme, and they all have to carry devices to dampen the hormones. Like many similar science fiction universes (e.g. Sassinak), it appears to be based on the premise that humans are basically bisexual. And for the most part, Torin comes across as asexual, or easily imagined as lesbian - sadly, she's not, and she hooks up with a guy (it's a good hook up, but still, it's a guy and she's interested in him, and there are no indications to the contrary). Terizan is a lesbian thief in a fantasy city. Most of her stories revolve around jobs for the Thieves Guild, and a couple involve her relationship with the mercenary, Swan. The first one, Swan's Braid, appeared in Swords of the Rainbow: Gay & Lesbian Fantasy Adventures, the first four Terizan stories are now collected in Stealing Magic and Relative Magic and the fifth story, The Things Everyone Knows, appears in Finding Magic (but has no obvious lesbian content). I have to mention The Fire's Stone, which I read some twelve times between the ages of twelve and twenty (and my younger brother surreptitiously nicked it from me every time I got it out from the library too. And no, he's not gay, as far as I know - it's just a damn captivating book. I spent ages trying to figure out why, but I guess it just hits all the right buttons. Sadly, no lesbians - but a very promiscuous bisexual prince, a rather repressed thief and then there's the asexual sorceress-princess who takes up the third corner of their love triangle. I actually think she may be the only asexual female who actually plays a major part in the plot of any book I can think of - anyway, it deals with all ends of the spectrum of sexual approaches very well. Oh, there are plenty of politics and death threats and torture and magic, too. In my opinion, it's the best book she ever wrote. Some of her others are about as good, some are much worse. (For more asexual female characters, see this post). Oh, I actually own a different copy of The Fire's Stone - the one in the photo at the start - which includes another story, Gate of Darkness, Circle of Light which has more gay guys, and is set in the same urban fantasy universe as The Keeper's Chronicles. Unfortunately, while she's very good at writing strong female leads, and relationships between men, Tanya Huff does not seem either interested or very good at (it could be either or both) writing lesbian characters and relationships. But she is a 'lesbian author' if you're looking for that. As a side note, she's married to Fiona Patton, another gay fantasy author. Asdfdfanjjfgh. You managed to say about Huff what I've been trying to say for literally years, when I try to explain Valor's Choice to my friends. Goodness, thank you. I would add that while the Four Quarters series has mostly bisexual characters, there are several significant lesbian characters who I think are very well portrayed. As well, the bisexual heroine of the first book,Magda, is in a long term nonmonagamous relationship with lesbian Stasya and their relationship in the books is clearly portrayed as her permanent primary relationship. That this is essentially a mariage is only further emphasized when Magda dallies with and gets knocked up by a handsome Duke while on tour for work. Although the Duke is the epitome of a romance hero, in all of the books,he and Magda never consider themselves to be in any kind of romantic relationship and everyone else, including Stasya and their children and the King agree. Stasya and Magda are two women in a primary romantic relationship and I think that makes it a lesbian relationship even if one of them is bisexual. Moreover, I think the way their relationship is portrayed is very well done. Finally, my understanding was that Huff is a bisexual in a long term lesbian relationship, which doesn't mean she doesn't also consider herself to be a lesbian, but this may be why her novels have so many bi characters. My two cents, for what it's worth.